We loved and listened to your enthusiastic feedback on Instagram and decided to turn the dog/cat mats into fixtures in our collection! Available in two different sizes (Large: 90x65 cm / Small: 65x50 cm), made from 100% cotton and washable at 30° degrees, they are the perfect accessories for your pets and the most stylish addition to your home. We have introduced some new colour ways and will continue to collect your feedback into how they are doing in your homes. Of course we did some very important user testing, and are more than happy to show you the very happy results of your very relaxed pups on our mats. How cute are they? We would love to see more relaxed cats and dogs so please send us your pictures and images to info@annacoxcushions.com, as well as your feedback and wishes. 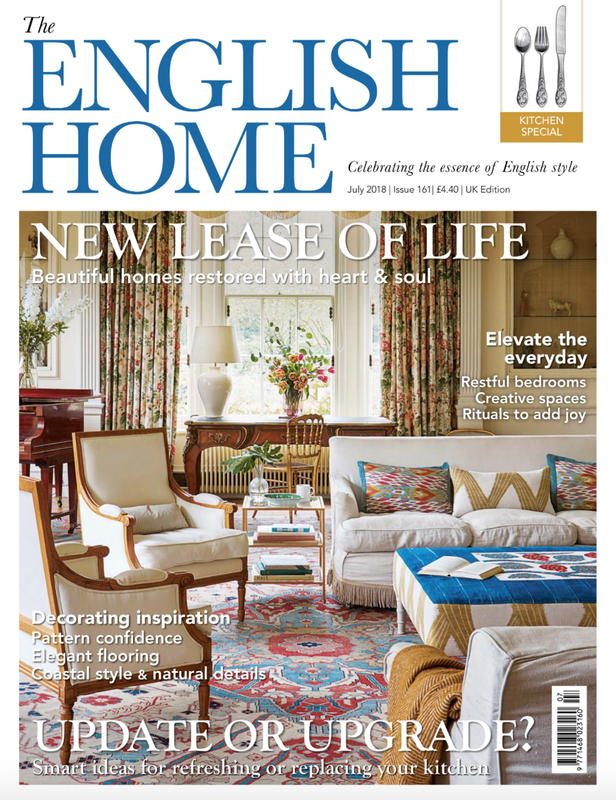 I know some of you are wondering why rugs are now gracing my little squares and stories on Instagram and now also our website. I decided to bring a very select few vintage rugs into my collection of home interiors. During my buying trips to Morocco, I couldn’t help but fall in love with the unique beauty of every single one of these rugs. They have all been washed and dried on the sunny Moroccan rooftops. The additions to my collection include the classic Beni Ourains alongside the beautiful coloured ones and all of them in lots of shapes and sizes. I pretty much fell in love with all of them and its hard parting ways! They are all vintage with a story to tell. After your amazing feedback when first introducing them as a sneak peek on Insta, I will continue sourcing the most amazing pieces for you! As every single one of them is a unique piece, we won’t be adding them to our online shop. The other exciting addition is our beautiful rainbow collection! We received so many requests for multi-coloured cushions and then came up with the idea for our beautiful Rainbow Collection. 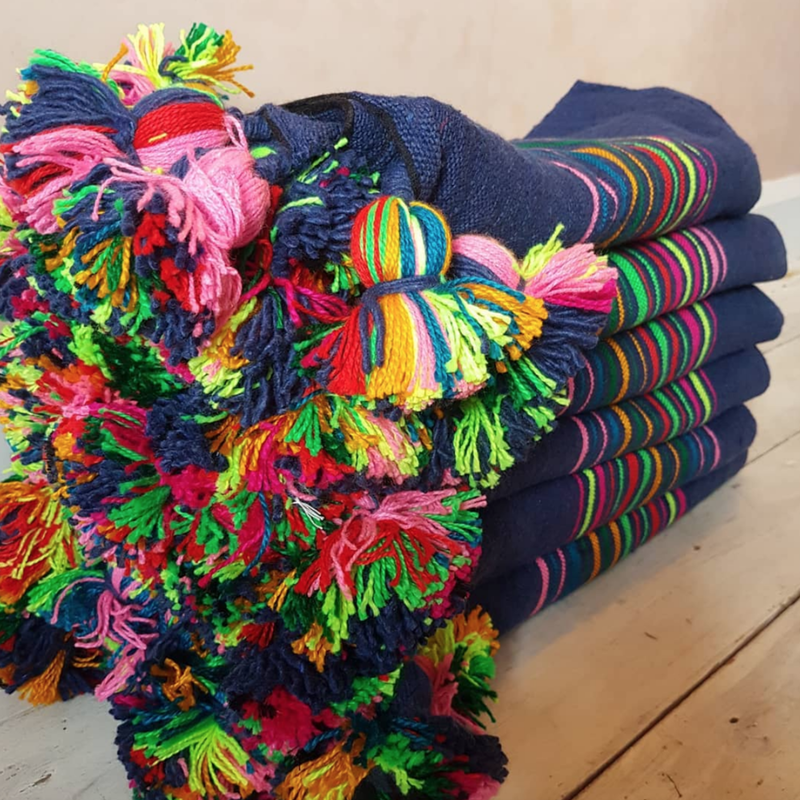 With one neutral colour in the background and multi-coloured stripes and pom poms we are so happy with how these turned out. 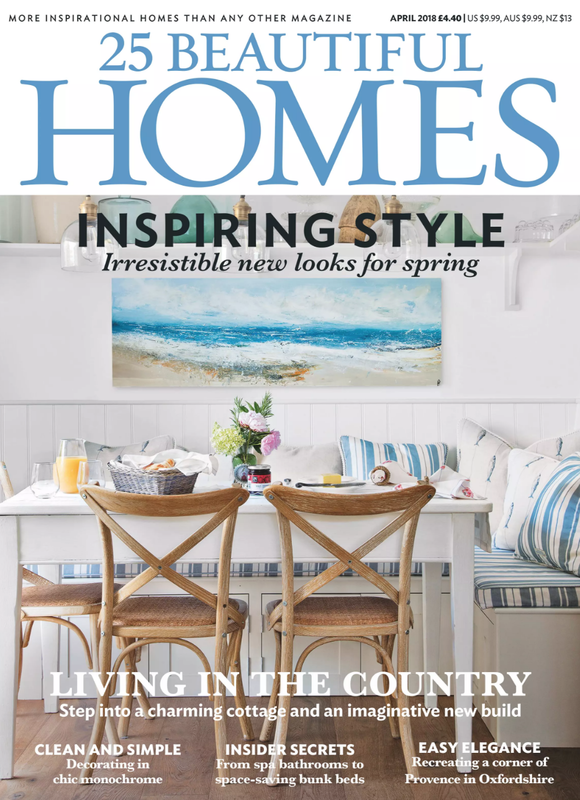 They are a stunning addition to any interior style and we are so excited to see your stylings! We have added some gorgeous cushions and throws to our online shop and will keep you posted on any updates of course. We cannot wait to hear your thoughts! I have this thing with monogramming. Don’t we all. It’s something to do with the shape of the letters and in our case, the bright colours. I knew that I wanted to tailor our cushions and throws to be able to offer something more personal. I had been going round in circles trying to source letters / designs / monograms in the right colours and soft fabric but getting nowhere! And there she was, on the doorstep right here in the Cotswolds. I met our very talented embroidery artist, Hannah, the creator of ‘Imagine Sew Beautiful’ at a networking event with Discovher. I knew we were going to have fun, creative times ahead as soon as she produced her array of neon threads. It was meant to be! It was a colour explosion. Do they look better ‘matchy matchy’ or clashing? There are so many possible colour combinations. Clashing is my personal favourite. I am so excited to be able to offer this service. I think it’s a great gift idea and we can create personalised sets for Godchildren, your own children and you. What next? Stars / bolts / years of birth / handprints / pets…..? Let us know and we will see what we can do (you can simply drop your message in the form below). It’s literally amazing what Hannah can embroider onto a cushion. Discover her beautiful work at http://imaginesewbeautiful.co.uk/ or follow her on Instagram @imaginesewbeautiful. For our detailed guide on monogramming click here, or simply go to your favourite Anna Cox cushion or throw and add the monogramming option! Thank you for your message on monogramming, we look forward to hearing your ideas and will get back to you as soon as possible! 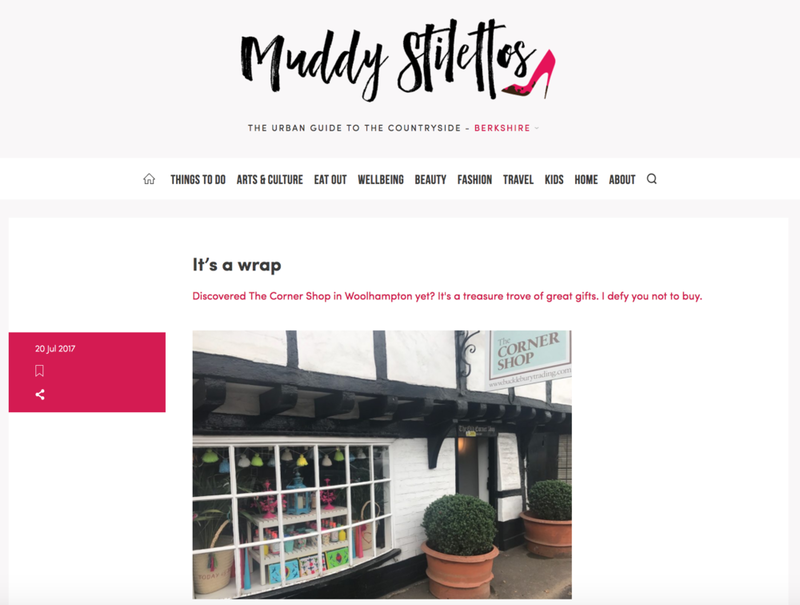 Thank you Muddy Stilettos for the beautiful feature of our cushions at the beloved "The Corner Store" in Woolhampton! Check out this lovely article on the best gift store ever, where you will always find the right something (whether you need it or not). And as of lately you can also find the most beautiful selection of our beloved cushions there, which you can discover here. 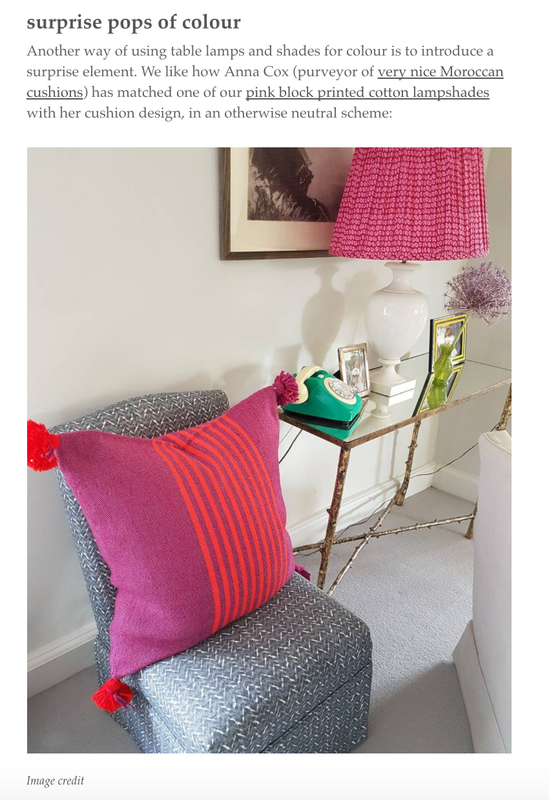 We are thrilled to discover our Pink & Orange cushion in Pooky's feature on table lamps for that added splash of colour. As you know, we are all about adding colour in the right places so we are loving all the beautiful interior design examples in this article. Make sure to read it here, thank you Pooky for including us. Order Pink and Orange cushion here.